Amed in Bali's northeast, with Agung volcano in the background. 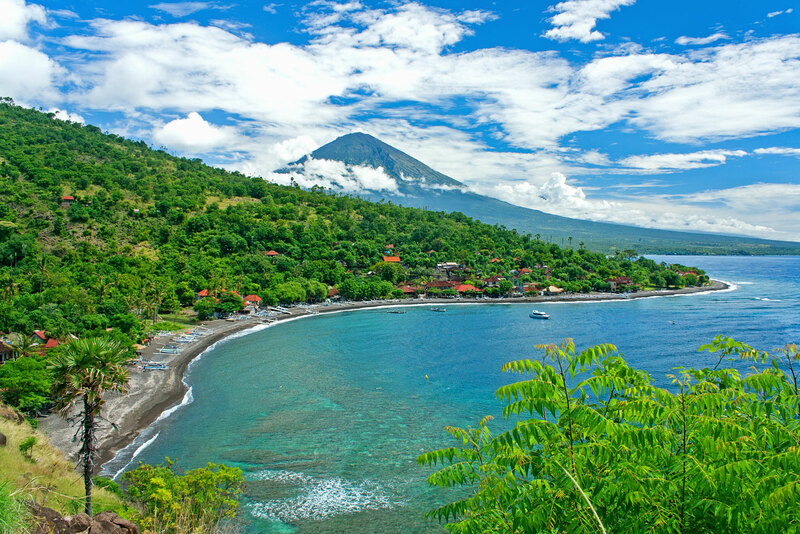 In a bed to find a slice of ‘authentic Bali’, we discover the Amed coastline. Bali bliss; an experience that many a traveller has gone in search of, only to find themselves wandering through the bustling laneways of Kuta, littered with sweaty clubs, rupiah-ravenous vendors, and squat men on mopeds. Once a small town boasting unspoiled beaches and a few shacks for homes, Kuta has grown hungry, enveloping neighbouring areas to become a powerful – if not shamelessly commercial, mecca for tourists. However more and more travellers are venturing inland for something authentic and less commercial, resulting in busloads of Chinese tourists now packing the streets of temple-filled gems like Ubud and Sanur. Then there’s Amed, one of a shrinking number of Balinese villages that still holds true to its quiet pace and natural beauty. Amed, Bali features some of the most lush greenery imaginable. You’ll find it along a jungle-dotted strip hugging the base of active volcano Mt. Agung, tucked away in Bali’s mountainous north-east corner. It is here that tourism is still slow, much alike the pace of life, where a number of pieces of infrastructure have only been assembled within the past decade. For the locals, excitement grows upon the arrival of every foreigner washing up on their black-sand shores with boogie-boards in tow – a sign that further investment in roads, electricity, and water will soon follow. It’s refreshing to explore a region barely touched by non-residents, where expansive pockets of thriving greenery linger between several villages that collectively make up the Amed coastline. Drawn towards some of the most impressive dive sites in the waters of the Indian Ocean, hoteliers and tourism operators have only recently begun to capitalise on increasing visitor numbers, evident by the number of bungalows and villas springing up between tuckshops and rice paddies. The region is filled with friendly faces, where locals are more than happy to offer you a lift on the back of their bike. It’s a worthwhile experience if you’ve been put off by the regular near-crash scenes in busier areas – however you’ll need to be comfortable with sharing your ride with a well-groomed rooster and a crate of tropical fruit. 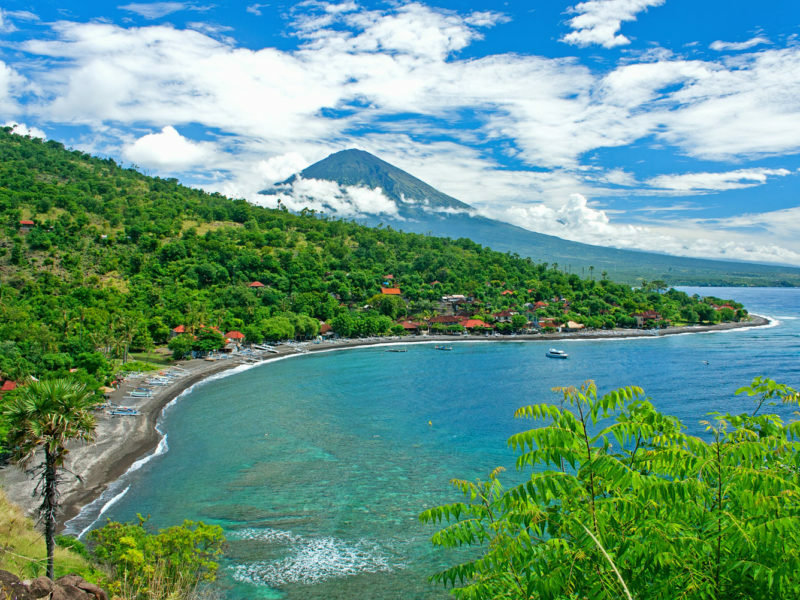 Amed in Bali features a stunning coastline and some of the most impressive diving spots. Vibrant colours engulf this community, from the vivid greens of local palm tree forests, to the bright blue of the surrounding ocean. But despite this naturally blessed landscape, local infrastructure is yet to tackle waste management – for among the bed of living colour lining the ocean floor is carelessly scattered fishing equipment, old clothing and plastic bottles. Further underwater are more pristine patches of sea life, along with US Navy shipwrecks at Tulamben acting as preservationists for the delicate coral, crustaceans and colourful creatures calling it home. It’s this magic of the underwater world where Amed’s greatest appeal lies, and for every tourist willing to speak up about the state of what lies beneath the deep, the reef and ‘burbs will benefit. Afterall, with exotic sealife to discover, friendly locals to meet and freshly-picked ramutans to fuel you, that’s more like Bali bliss. From Denpasar Airport, the drive is about 100km and at least three hours depending on traffic. Prices start at Rp400,000 (approximately $40) for a taxi/private driver, but any smart traveller will be ready to bargain for a good deal. Withdraw as much cash as possible before heading to Amed – there are only a handful of ATMs along the entire 10km coast. Santai Hotel has six air-conditioned bungalows, a swimming pool, spa and restaurant. Rooms from US$50 a night, breakfast included. European-owned Adventure Divers Bali offers diving expeditions to a number of dive sites, the most picturesque being Liberty shipwreck (45 euros for two dives) and Japanese shipwreck (50 euros for two dives). Alternatively, visit to the Shell Museum at the Aiona Garden of Health – it’s an incredible location for a yoga class and is run by a hilariously quirky German expat.